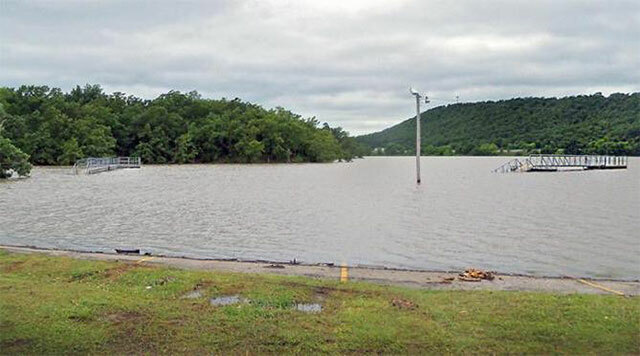 Many public hunting and fishing areas managed by the Oklahoma Department of Wildlife Conservation have sustained damage from the historic flooding that has engulfed many sections of the state this month. Especially hard-hit are fishing areas at the Lower Mountain Fork River below Broken Bow reservoir and roads and camping sites at Blue River Public Fishing and Hunting Area north of Tishomingo. Also, many wildlife management areas across the southern half of the state have experienced flash flooding of streams and creeks due to May's record rainfall. By May 25, Oklahoma City had shattered its record for the all-time wettest month on record, with more than 18 inches of rain. Early May's heavy rainfall saturated the ground in many areas, and subsequent precipitation has caused flash floods and pushed creeks and rivers out of their banks. For only the fourth time in Lake Texoma's history, water began rushing over the emergency spillway May 24. At the Lower Mountain Fork River trout fishing area, it is feared that many of the accessibility enhancements and improvements were washed away. Officials must wait for confirmation until the record discharge of water from Broken Bow is curtailed. The Wildlife Department has suspended regular trout stocking in the Lower Mountain Fork trout area, but stocking will continue at the Lower Illinois River trout fishing area. Parts of the Blue River Public Fishing and Hunting Area were underwater and some roads have been closed for safety reasons. 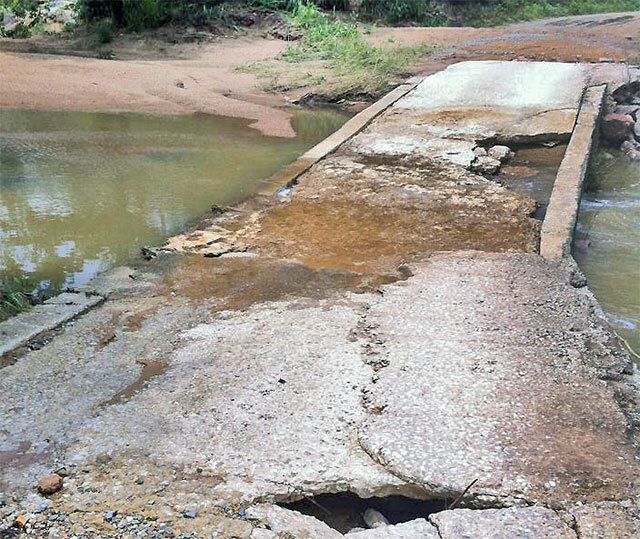 The flooding has damaged the low-water crossing on the road to camping Area 1, and area manager Matt Gamble said that road would remain closed for an extended period. Also, camping Area 2 and part of camping Area 1 were closed due to safety concerns. On some wildlife management areas, roadways and tinhorns were devastated by floodwaters, making vehicle access impossible in some cases. At Love Valley WMA near Marietta, floodwaters had covered some roadways a full two miles from the Red River. 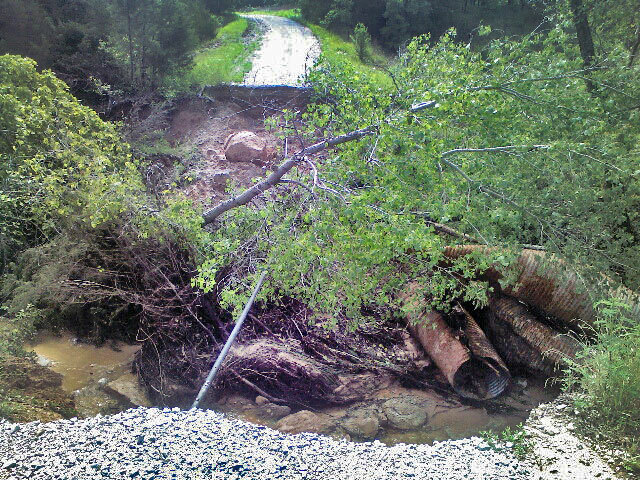 At Lexington WMA in Cleveland County, roadways were eroded by the flooding, exposing tinhorns and creating large drop-offs. Anyone who plans to visit Department-managed areas in the near future can expect to find road closures in areas with damage or flooding conditions. 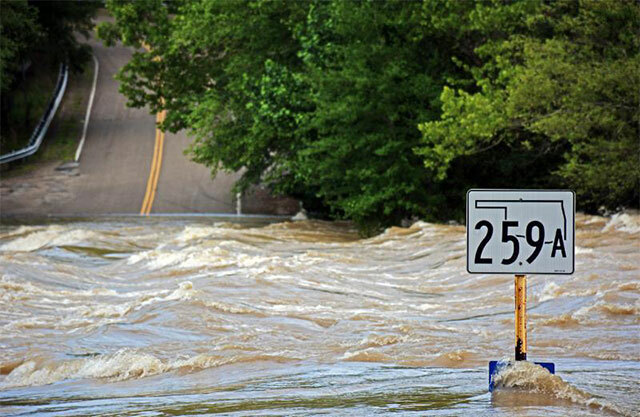 If water is covering a roadway, do not drive into the water; it is possible that the roadway beneath the water has been eroded, and vehicles can easily be carried away by floodwaters. Roads and bridges may remain closed after flooding recedes until road and bridge integrity can be assessed. Those who plan to visit Department-managed areas are urged to call the area manager ahead of time to find out about closed areas and road access. A list of contacts can be found on the Wildlife Management Areas page at wildlifedepartment.com. The effect of the heavy rainfall and flooding on wildlife will be more pronounced around overflowing rivers and overfilled lakes. High water will displace wildlife that normally stay around the water. These animals will be seeking the safety of higher ground. Some fish in reservoirs will likely be lost downstream with the record water releases through dams and spillways, but overall fish populations in reservoirs should not be greatly affected. Ground-nesting birds including bobwhite and turkey could be affected by the heavy rainfall and cooler-than-normal conditions. Hatchlings will be in greater danger of pneumonia, which could impact reproduction in those species. Biologists said assessing the effects of this May's weather will take time. Many farm ponds and reservoirs that had dried up or were seriously depleted during four years of drought are now filling or have gone beyond flood pool capacity. The Tulsa District, U.S. Army Corps of Engineers, reported Wednesday that the water levels at Eufaula, Texoma, Hugo, Wister, Arbuckle, Pine Creek, Broken Bow, McGee Creek, Thunderbird and Sardis lakes were at or above the flood pool elevation. Most of those lakes were under 24-hour surveillance. New record water levels had been set at Hugo, Wister, Broken Bow and Pine Creek. The water level at Eufaula was about 2 inches below that lake's all-time record. Water was being released through Eufaula's dam at a rate of 172,000 cubic feet per second, "which greatly exceeds" the downstream channel's capacity. Major flooding is expected along the Arkansas River from Moffett, Okla., and into some Fort Smith, Ark., subdivisions. The Corps called it "an extremely dangerous and life-threatening situation." Wildlife Department game wardens have been in the field assisting local authorities with the flooding situations statewide. Wardens have been called upon to set up barricades and assist in search operations, officials said.